Well, now that we are back from vacation and everyone is done throwing up, (more on that later! ), I can finally tell you guys a little bit about how it went! In a word-fabulous! We had such a great time, and can't wait to go back again soon! We had the privilege of spending our time at the Music Road Inn in Pigeon Forge. The hotel itself was absolutely beautiful, and the people there, even better! The hotel itself is just beautiful, and the lobby looks like something out of a movie set! The giant fireplace just made the whole place feel so warm and cozy, like coming home! Check in was an absolute breeze, and Michelle at the front desk was super helpful and friendly. I have to say that we felt welcome right away, and that is definitely a nice feeling! Our room was a standard double queen room, and it was beautiful! My sister decided to come with us, so it was three adults and two kiddos, and the room was plenty big enough for all of us! I have two favorite parts of the room: the first one is the bathroom! I know, I know, that sounds crazy, but really! The bathroom is split off into two parts. One half has the toilet and shower, and the other half has a huge vanity with double sink, bench seat, and huge mirrored closet. I loved that! It was so nice to have room to spread out and even sit down when getting ready, because I sure don't get to do that here at home in our tiny house LOL! My other favorite part? The view! We had a waterpark view room, which would have been fabulous in the Summer, to watch everyone on the water slide and in the pool from our balcony, but alas, it was still Winter.. However, the view of the mountains in the background absolutely made my stay! I spent most of my time out on the balcony looking at the view! What a beautiful sight to be able to wake up to every morning! The beds in our room were fabulous! They were too tall for my small guy, however, and we had to end up asking for extra pillows and blankets to make him a bed in the floor.. This was after he fell off of the bed like five times in the first hour we were there.. I guess he will just always be my clumsy one lol! But, for everyone else, the beds were great! Just ask my dear sweet hubs, who wanted to sleep til noon everyday! We had a great time at the Music Road Inn, and I am so glad that we did decide to go in the Winter, although I had my doubts before we left home... It was so peaceful and quiet there and I bet we probably only encountered ten other guests the entire time! I know this is a big difference from what it is like during the busier times of the year, so I enjoyed the peace and quiet, and the perks of being the only ones around! The boys had a blast in the indoor pool (and me in the hot tub LOL! ), even though us adults thought it was freeeeeezing! I swear, my kids would swim outside in the snow if there was a pool out there! They just don't care! 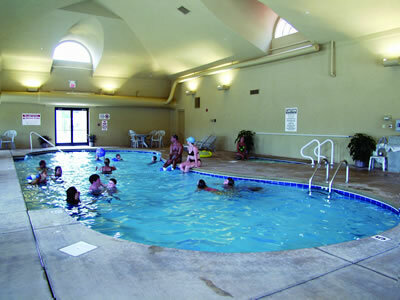 We really liked the fact that the indoor pool was open 24 hours. It was a great treat to be able to just take Tater down to the pool and leave Bean upstairs with Nanny at night time, and be able to spend some one on one time with him. He hardly ever gets a chance to not have his little brother shoved in his face, so he really reveled in his "alone time" LOL. We, of course, also spent a lot of time in the arcade, winning all sorts of prizes. My boys (and hubby too!) all have weaknesses for video games, and arcade games, especially the ones where you win a prize... Needless to say, $15 later, we won Bean a ball, and that is about it. (Hey, I said they like games, not that they are good at them! ha!) Oh, and I can't believe I forgot to mention FREE HBO! I am so cheap, I refuse to pay for both HBO and Showtime at home (got to have that Showtime for Homeland and Dexter! ), so I was thrilled to be able to watch HBO :) Ahh, perks of vacation! Oh my goodness, I can't forget breakfast! 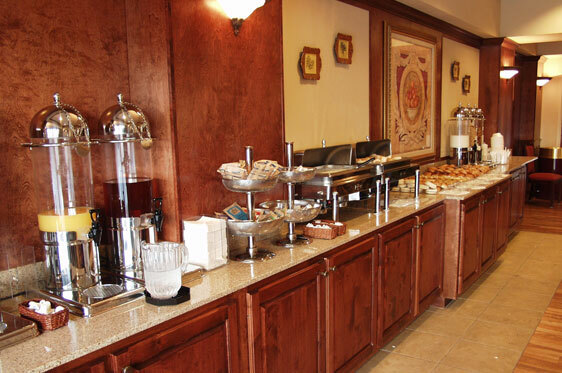 Part of the reason that drew us to the Music Road Inn in the first place was the complimentary breakfast. No one in my crew (except me of course) is a morning person. Getting my three guys up, dressed, and off to breakfast at a restaurant is a real chore. Plus, once I get them to breakfast, I pay for all of these meals that no one eats. I mean really.. Bean wants like a tiny drop of scrambled egg and a piece of bacon, and Tater will eat one piece of toast and a banana. Is that really worth me driving the car to a restaurant, sitting down, ordering, waiting, and all that? I think not. The breakfast here was AWESOME! I had heard about the homemade cinnamon rolls before we even checked in, and yes, they do live up to the hype! I loved the fact that the breakfast room was big enough for a bunch of people,and you didn't have to feel crowded and claustrophobia didn't set in! I give breakfast a definite approval here, and that is a big deal coming from my crew! I do wish I would have gotten a few more pictures of our room, though. I had big plans to do a bunch of photos of the whole hotel on Saturday morning before we were heading out, but... we had an issue that involved my oldest son catching the flu and throwing up on every tourist attraction in the state of Tennessee (Okay, I am exaggerating, but only a little!) Needless to say, when coupled with the impending Snowstorm Of Doom that was hitting later in the day on Saturday,we decided it would be best to just head on home before things got worse. 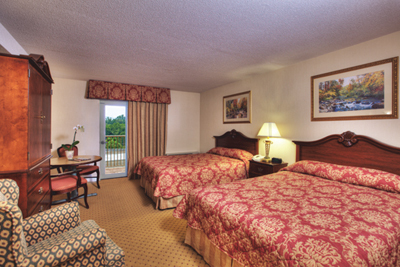 So, I am going to post a few pictures of Music Road Inn from their website too, just so you can see the things I missed! 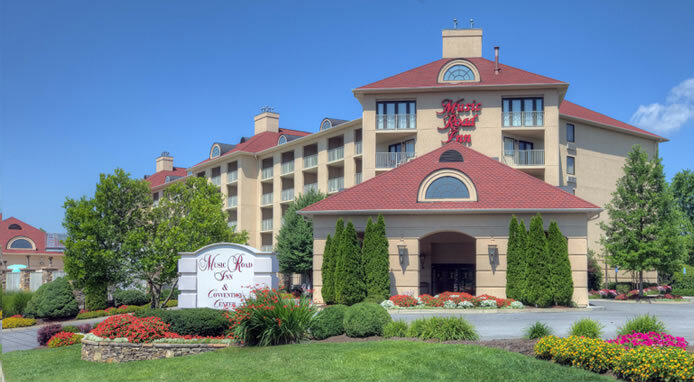 If you are looking for a real family friendly hotel in the Smokies, Music Road Inn should be the one that you pick! I know how happy I am with our stay, and my family really had a great time! If you are interested in checking out their website for yourself, you can click here to go there directly. Or, you can be sure to follow Music Road Inn on Twitter and Facebook for the latest news, discounts, and promotions! Thanks again, Music Road Inn staff, and we will be seeing you again real soon! We received a complimentary stay in exchange for this post. However, all views, thoughts and opinions are 100% our own.